We really liked The entertainment team. They were extremely friendly and good at what they do. We really appreciate what they did for us, as adults and for the little ones. They were simply the best! Also the food was really good. The staff was friendly! Thank you! The sunrise view from the balcony and bed, the sea view from the room, the staff members who were smiling at us and wishing us a good day, the room very clean, sheets changed daily, the hotel is nice (not exactly like in the photos where they got the best angles but a nice place to stay), the walk to the beach through the sand dunes. 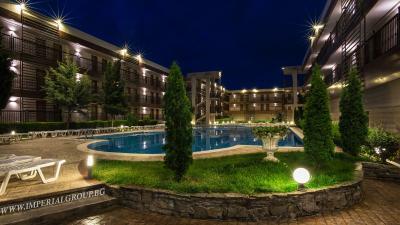 The hotel is located away from the noise of the center of the town in a quiet part of the town. We concider the stay good value for money. 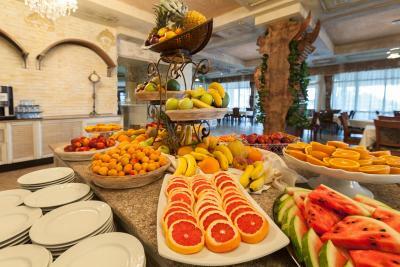 I liked the food diversity, the fact they had a lot of fresh vegetables and fruits. 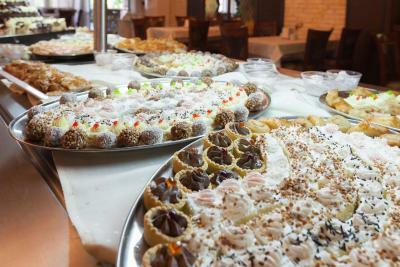 One of the restaurants is outside and offers even a late night snack. The beds are comfortable and they clean the rooms everyday. Also they have 2 pools and a small splash area for the children. The resort has a lot of services that can achieve your expectations: quality of room, food, swimming pool, the garden with different ways to enjoy, etc. Room were nice, the entertainment team was really good and always there to help in any way you may need it. Restaurant staff were very nice, though they were not speaking english. 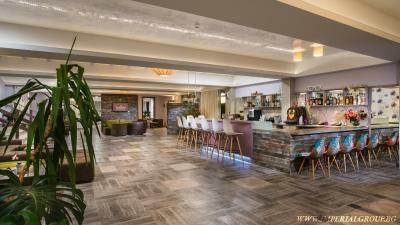 Beautiful renewed hotel, good food and drinks. Worth every second and money spent there. 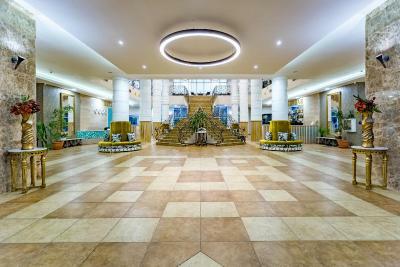 Club Calimera Imperial Resort This rating is a reflection of how the property compares to the industry standard when it comes to price, facilities and services available. It's based on a self-evaluation by the property. Use this rating to help choose your stay! 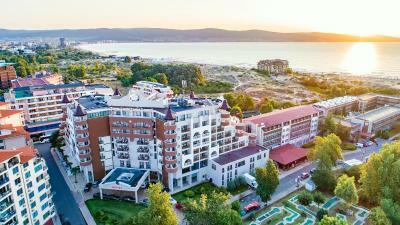 One of our top picks in Sunny Beach.The Imperial Resort is set in the southern part of Sunny Beach, only 500 feet away from the Black Sea and the beach, and a 20-minute walk from the Old Town of Nessebar. 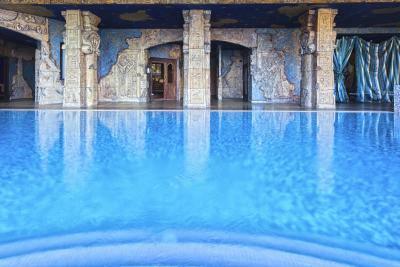 It consists of 2 buildings and offers large indoor and outdoor pools. 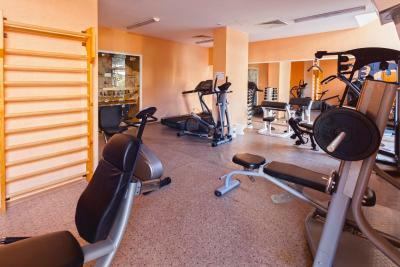 On site guests can also use a fitness center free of charge. A safety deposit box is available free of charge. All rooms are equipped with a flat-screen satellite TV, air conditioning, hairdryer, mini-bar at an extra charge and direct-dial telephone at an extra charge. A balcony or patio is featured in every unit. Free WiFi is available. 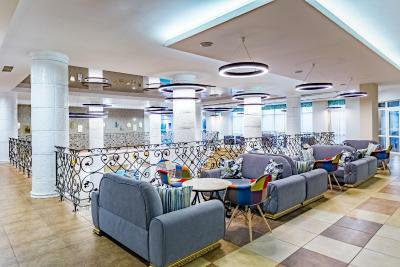 Casablanca and Alexandria restaurants are decorated in Mediterranean style, equipped according to the latest all inclusive trends and offer international cuisine, live show-cooking for breakfast and lunch and 2 thematic evenings every week. 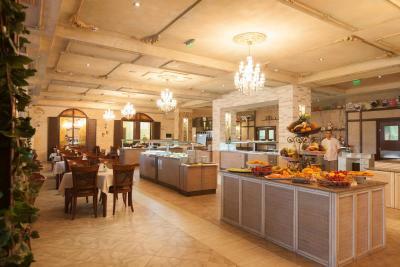 On site there is also a snack bar, 2 lobby bars, a pool bar, a garden bar and à la carte restaurant. 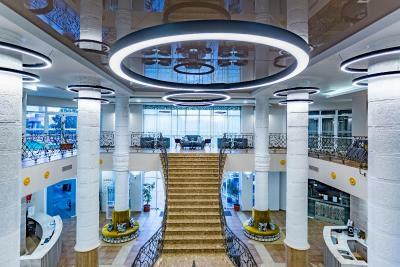 The on site spa center Paradise, located at Imperial Beach building, offers a variety of massages, treatments, Turkish bath, saunas at a surcharge. 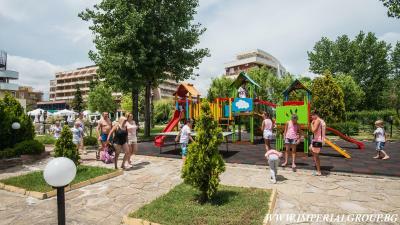 The resort promises a lot of fun and entertainment to the little ones with its childrens' club, playgrounds, animation and children swimming pools. 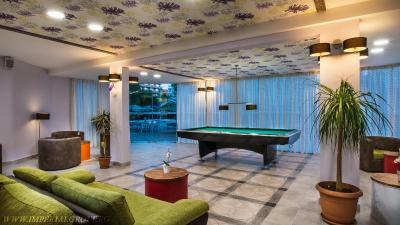 Guests can also enjoy beach volleyball, water ball, mini football, table tennis, billiards and mini golf. Burgas Airport is 16 mi away. 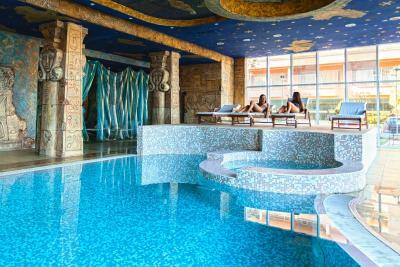 When would you like to stay at Club Calimera Imperial Resort? 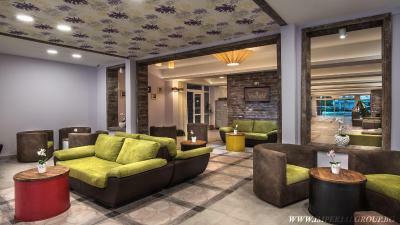 Luxuriously appointed and fully renovated in 2017 room with warm earthy tones, and a work desk. It has carpeted floors and a TV. A safety deposit box is available free of charge. Please note that the mini-bar is available at a surcharge. 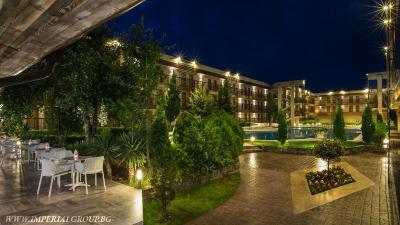 Private parking is available on site (reservation is not possible) and costs BGN 12.13 per day. Spacious and fully renovated in 2017 Junior Suite, equipped with a mini-bar, air conditioning, a balcony, a TV with satellite channels, a direct telephone line and a free safety deposit box. 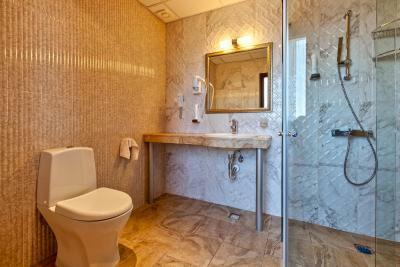 The private bathroom is equipped with a shower and a hairdryer. Consists of two separate rooms, a bedroom and a living room. 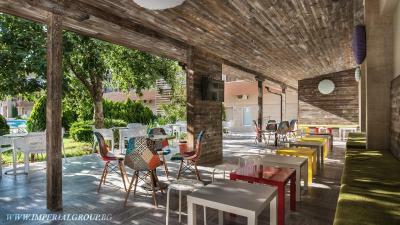 It is fully renovated in 2017 and features a private bathroom with shower. In the living room there is an expandable sofa. 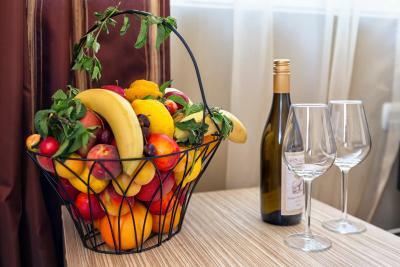 The suite is equipped with a mini-bar, a balcony and a TV with satellite channels. A safety deposit box is available free of charge. 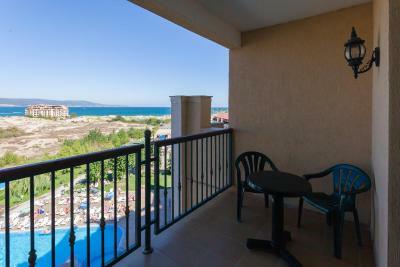 The junior suite is fully renovated in 2017 and features air conditioning, a seating area, a TV with satellite channels, a balcony with partial sea view, a direct telephone line and a safety deposit box. 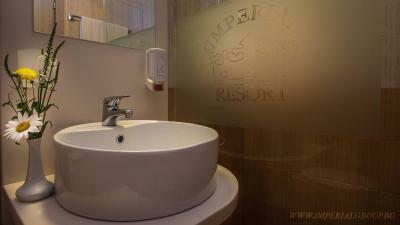 The private bathroom is equipped with a shower and a hairdryer. A safety deposit box is available free of charge. This double room is fully renovated in 2017 and features a balcony, air conditioning, TV with satellite channels and seating area. A safety deposit box is available free of charge. This double room is fully renovated in 2017 and features a seating area, cable TV with satellite channels and a mini-bar. A safety deposit box is available free of charge. The unit is fully renovated in 2017. 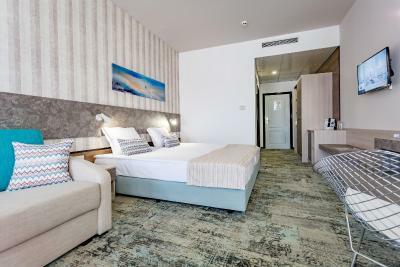 This twin or double room,located in the adjacent building, is fully renovated in 2017 and has a balcony, air conditioning, mini-bar and free WiFi. 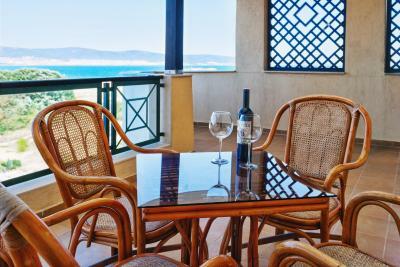 This family room is fully renovated in 2017 and has a balcony, sofa, TV with satellite channels and air conditioning. A safety deposit box is available free of charge. This family room is fully renovated in 2017 and features a balcony, a TV with satellite channels, a mini-bar and a seating area. A safety deposit box is available free of charge. 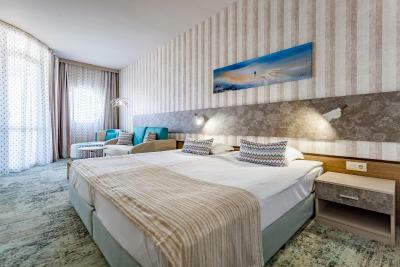 This twin or double room, located in the adjacent building, is fully renovated in 2017 and has a balcony, air conditioning, mini-bar and free WiFi. This twin or double room,located in the adjacent building, is fully renovated in 2017 and has a balcony, air conditioning, extendable sofa bed and free WiFi. 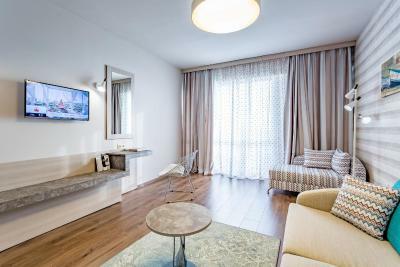 This suite is fully renovated in 2017 and has a balcony, mini-bar, a TV with satellite channels and air conditioning. A safety deposit box is available free of charge. This suite is fully renovated in 2017 and features a balcony, mini-bar and satellite TV. A safety deposit box is available free of charge. 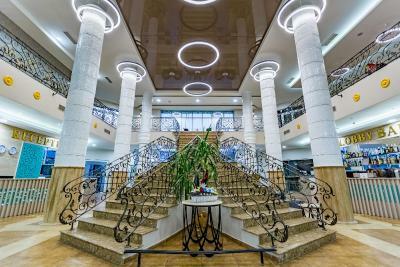 This suite, located in the adjacent building, is fully renovated in 2017 and features a living room with a sofa, 2 bedrooms, a private bathroom with a shower, a patio, air conditioning and satellite channels. A safety deposit box is available free of charge. 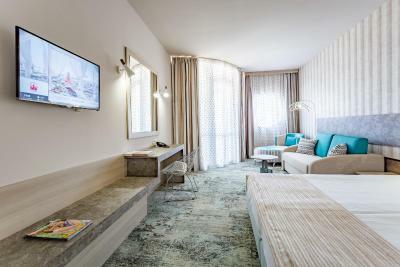 This family room,located in the adjacent building, is fully renovated in 2017 and consists of 2 standard rooms with interconnecting door, each equipped with a bathroom, TV, air conditioning and balcony. A safety deposit box is available free of charge. This twin/double room is fully renovated in 2017 and features a balcony, air conditioning and sofa. A safety deposit box is available free of charge. This twin/double room is fully renovated in 2017 and has a balcony, mini-bar and air conditioning. A safety deposit box is available free of charge. This twin/double room features air conditioning, seating area and satellite TV. 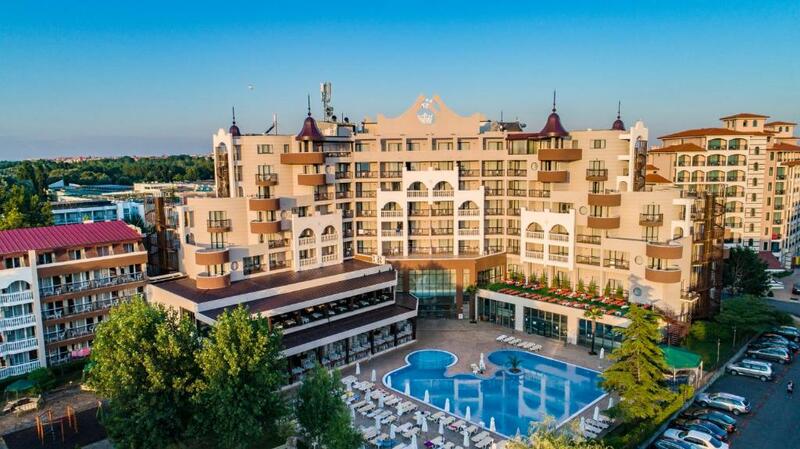 The hotel is built in 2005 and will open doors fully renovated for summer 2017! 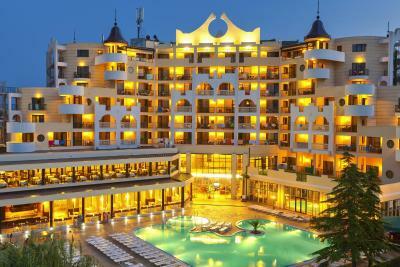 It is a landmark of 4-star Sunny Beach Hotels. 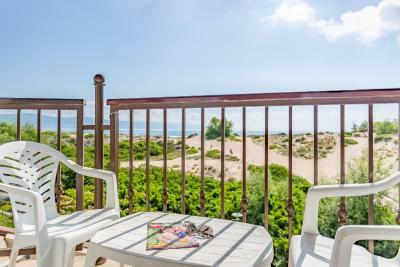 It is right next to the UNESCO protected dunes just 50 meters from the beach. 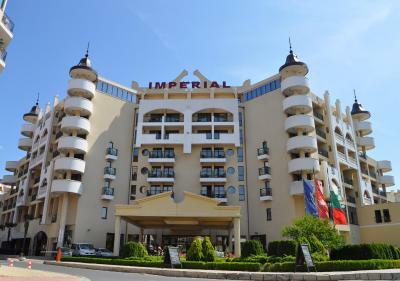 The Imperial Hotel offers high quality all-inclusive service, entertainment for adults and children, spa center, private beach and much more for everyone to choose from. 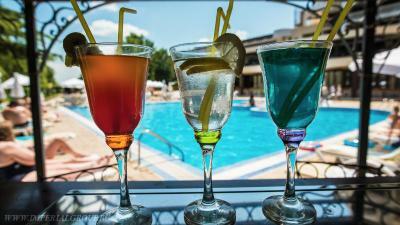 House Rules Club Calimera Imperial Resort takes special requests – add in the next step! Club Calimera Imperial Resort accepts these cards and reserves the right to temporarily hold an amount prior to arrival.